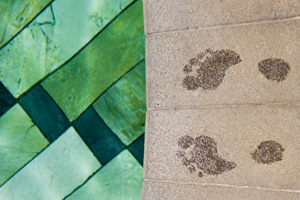 Tiled concrete pools can last for many decades but as with everything they need repair and maintenance over the course of time. It’s possible to tackle the job as a DIY project but most people prefer to use a specialist contractor. We can help you find a suitable contractor, just click here to locate one in your area. The most common reason for renewing the mosaic tiles in your pool is that, over the years, freezing water has got behind the tiles above the waterline and they have started to pop. It might be tempting to just repair the tiles that are obviously damaged but realistically the entire perimeter will need to be re-tiled in order to do the job properly and have it last for years to come. First of all the pool needs to be drained. You should consult your local water authority to see what restrictions they might have on how you should do this. Check if there is groundwater present and if it safe to drain the pool? Better still, seek advice from a professional pool contractor. Once drained your pool is going to be out of action for about 2 weeks, perhaps longer if you are doing the mosaic repair yourself. Remove the old mosaic pool tiles. Once your pool is drained the coping and old tiles need to be removed along with what is known as the scratch coat, which is what bonds the tiles to the concrete. Rather than simply repairing your pool, you might want to lay an entirely new mosaic pattern in an existing pool. If that is the case then all the old mosaic pool tiles will have to be removed and the entire area for the new design prepared for tiling. The old mosaic tiles will have to be hammered off either by hand or with a power tool. This is a long and dirty job. The area to be tiled then has to be prepared by power washing with a jet washer and then of course the pool has to be thoroughly drained and cleaned. It’s also a good idea at this stage to check that the waterproof render exposed beneath the old tiles is still in good condition and good enough to place the new tiles onto. A level line for starting the tiling is set out with a builder’s line and spirit level or by using a rotary laser spirit level. A fresh scratch coat is applied and the tiling can begin. Mosaic pool tiles come as either individual pieces or as sheets. If you are applying a new design then there will be a detailed plan to follow for the placing of each and every tile. Once the tiles have all been laid then the scratch coat will need at least a couple of days to set before grouting can begin. Grouting the tiles is a fairly straightforward job as long as equal distance has been left around each tile. The colour of the grout can be chosen to complement the colours in the mosaic tiles. Another couple of days for the grout to dry and then the pool can be refilled. Renewing the mosaic lining of your swimming pool can give it a whole new lease of life or a brand new and luxurious look. The principle isn’t so different from re-tiling a bathroom or shower but to be fair the scale of the task is going to be much greater. The precision needed to install a mosaic pool with a finish that you are really proud of means that calling in a pool professional is the option that most people go for. Even if your pool is just a few years old, you might be surprised at how many new ideas and technologies there are now available to improve the experience of running and enjoying your own swimming pool. A MultiCyclone unit works as a pre-filter between the pump and the main filter. Trapping particles before they reach the sand filter, it reduces the amount of backwashing that you need to do and so saves energy, water and cuts down on your chemical use. Triogen UV water treatment uses ultraviolet light to kill 99% of water borne organisms and so reduces your need for chlorine. The BADU EasyFit pump is 20% more efficient than most other popular pool pumps and can be installed to replace almost any other pump without the need for expensive re-plumbing. EVA Optic LED lighting is not only incredibly efficient compared to traditional pool lighting, the units are also engineered specifically to withstand moisture, heat and chlorine. If you attach a DMX controller to the LEDs then you can program in an infinite range of coloured, mood lighting effects. These are just a few of the new products that you might take the opportunity of installing while your pool is being resurfaced. We can help you find a skilled professional in your area who could also help you with exploring the options available for a new mosaic design or even help you design a personalised mosaic. The find a supplier link at the top of this article can get that process started right away.